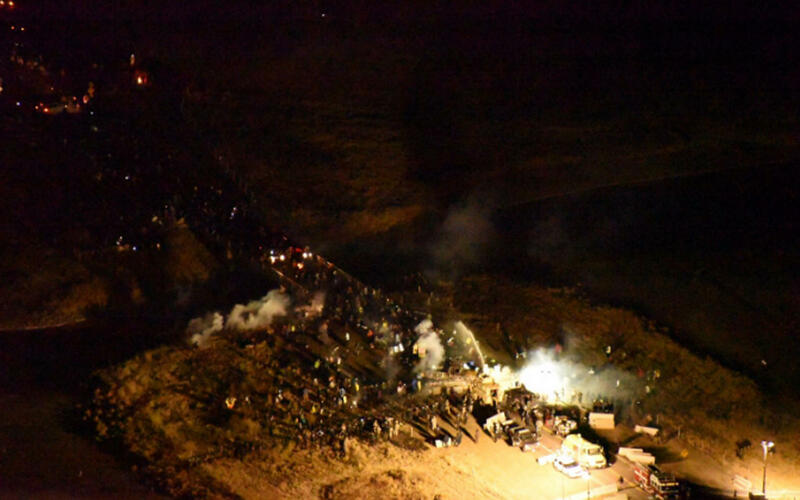 CANNON BALL, N.D. -- Tension flared anew at the Dakota Access pipeline as protesters tried to push past a long-blockaded bridge on a state highway, only to be turned back by a line of law enforcement using water cannon and what appeared to be tear gas. A live stream early Monday showed a continued standoff, with large lights illuminating smoke wafting across the scene. According to the sheriff’s office, there were still as many as 200 protesters on the bridge as of 1 a.m. local time, and authorities vowed to stay on-scene until all protesters were off the span. At least one person was arrested. Protesters said a gym in Cannon Ball was opened to aid demonstrators who were soaked on a night the temperature dipped into the low 20s or were hit with tear gas. Rema Loeb told The Associated Press he was forced to retreat from the bridge because he feared being doused with water on the freezing night. Others, he said, needed medical treatment after being hit with tear gas. “It’s been just horrible,” said the 83-year-old Loeb, who traveled from Massachusetts about two weeks ago to join the protests. The bridge lies near where protesters had set up camp on private property owned by the pipeline developer, Energy Transfer Partners, before they were forcibly removed by law enforcement Oct. 27. It’s also about a mile from an uncompleted section under Lake Oahe, a Missouri River reservoir, where work has been on hold by order of federal agencies. There were reports of protesters setting fires, says CBS Bismarck, North Dakota affiliate KXMB-TV. Area fire departments were on-scene, the station said. Later, the sheriff’s office put the number fires at about a dozen. A video shot by a protester showed what appeared to be water cannon and tear gas being fired at protesters. One medic for the protesters said rubber bullets and pepper spray had also been used. The office said one law enforcement officer was hit on the head by a thrown rock, adding that officers had also had burning logs and rocks shot from slingshots aimed at them. Situation at camp is serious. Approx. 200 WPs cold wet and exposed. Emergency relief plan being enacted. Cannonball gym open for relief. Phone calls to the sheriff’s department late Sunday went to an answering machine. The 1,200-mile, four-state pipeline is intended to carry oil from western North Dakota to a shipping point in Illinois. But construction of the $3.8 billion pipeline has been protested for months by the Standing Rock Sioux, whose reservation lies near the pipeline route, and the tribe’s allies, who fear a leak could contaminate their drinking water. They also worry that construction could threaten sacred sites. Energy Transfer Partners has said no sites have been disturbed and that the pipeline will have safeguards against leaks, and is a safer method of transport for oil than rail or truck. The company has said the pipeline is largely complete except for the section under Lake Oahe. On Friday, Kelcy Warren, the chief executive of Dallas-based Energy Transfer Partners, said the company is unwilling to reroute the pipeline.